An observant hobbyist is probably already aware of the fact that the two species of spotted eagles that live in Estonia may form mixed couples and be quite successful in nesting. There is data about the viability and reproduction capability of the offspring of mixed couples. It is possible that Teele is just one of those spotted eagles. Her external characteristics and measures originate as if from both species. The length of wings and toes, colour of plumage and body weight are more like those of a greater spotted eagle – the colour of eye iris, the colour under the wings and measures of beak fit more to those of a lesser spotted eagle. Thus, Teele is a unique opportunity to observe the activities of one hybrid spotted eagle… Teele received her monitoring device on 24 September 2005 in the northern part of Viljandi County. When she was caught, she might have already been migrating and may thus not come back to the place where she was caught. After she was released, Teele headed to the south and in five days she was in Central Latvia. 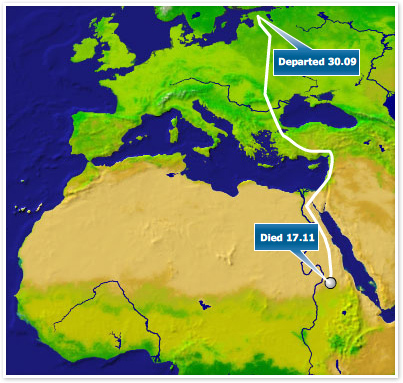 Unlike the migration route of greater spotted eagles, the migration route of Teele is located in the east and takes her through the eastern part of Latvia, Belarus, Ukraine, Turkey, Egypt and Sudan. Two days before she died Teele made a record flying about 400 kilometres and then another 200 kilometres and on her last day she managed to cover only 120 meters.